We now have another volcano erupting in the Pacific. The second one happened in Indonesia. Mount Agung on the Indonesian island began to erupt on Thursday forcing evacuations. 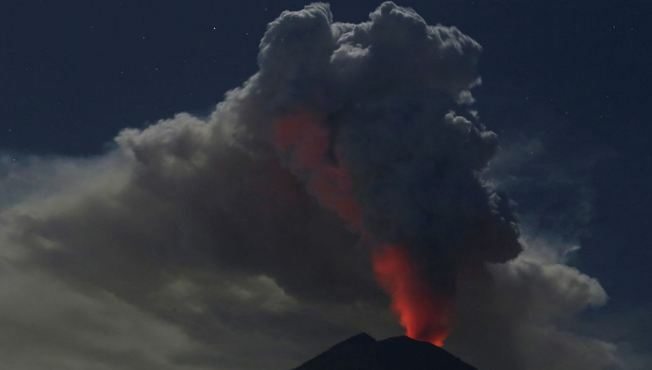 More than 400 flights had to be cancelled because planes cannot fly through volcanic eruptions. I have been warning that simply correlating all the data illustrates that when the energy output of the sun declines moving into solar minimum, this is when we historically see a sharp rise in volcanic eruptions. The exact cause is not my job to figure out. It probably has some link to gravity. Nevertheless, the greater the number of volcanic eruptions, the greater trend we will see toward global cooling and that can lead to crop failures and famine. This has NOTHING to do with my personal opinion or some theory I have concocted to support a predetermined conclusion. This is simply the correlation, plain and to the point. I will leave it to someone else to explain the cause. I am merely pointing out what has come out of our computer model that is tracking everything. This is NOT me making some opinion or lucky guess. It is what it is, not me personally. It is also NOT something I would enjoy being correct on. I just report what comes out of the computer. People have tried to see if they can duplicate our model. I really get a chuckle out of that. They expect to do it on the cheap by getting free data. Good luck on that one. I had crews go to the Royal Newspaper Library in London to work for more than a year to collect price quotes back to inception because most of the data required for long-term forecasts does not exist in public databases. 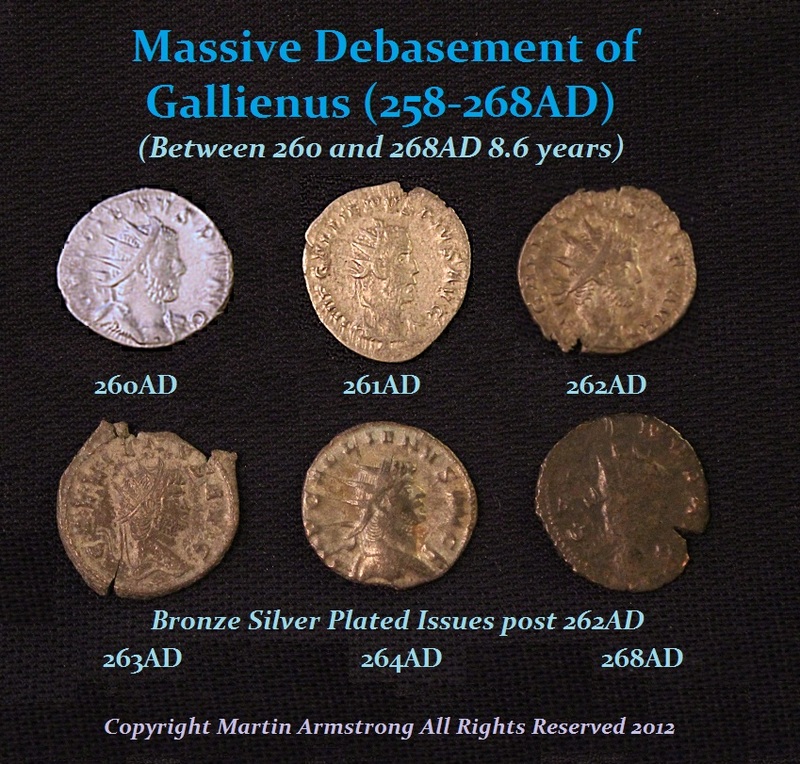 I had to assemble the massive collection of monetary history to actually track the economy back into ancient times. The scope of the data to even test such correlations is massive. This stuff cannot be accomplished by free downloads. 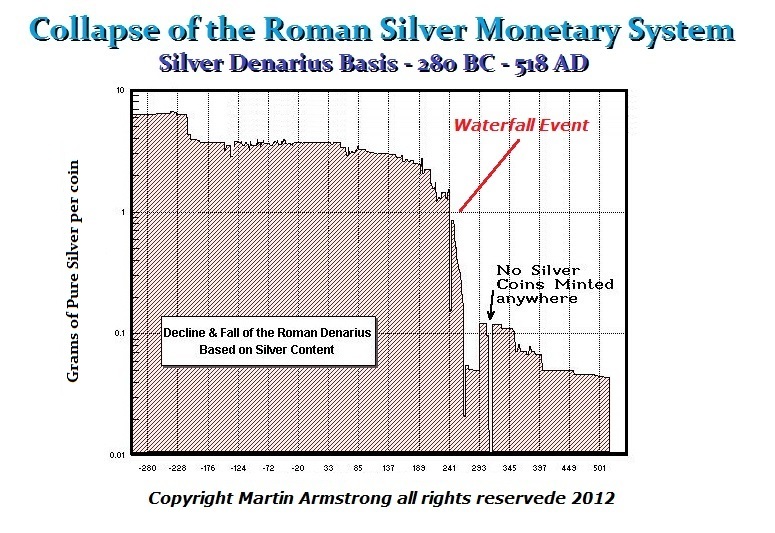 I discovered what I have called a Waterfall Event by putting the Roman monetary system together to answer a simple question: How did Rome fall? Was it gradual or abrupt? I have been fortunate in life. I was able to make enough money to fund a research project that no one else seems to have been willing to spend the same time or money on. It was simply a passion of mine because I enjoy history. I was also not married so I had the time to do what my passion inspired me to do. Everyone always asks when will I get married. I respond, 1) when I meet the right person, and 2) when I grow up. Until then, I simply follow my passion. Life is a journey or a quest for the pursuit of knowledge. When there is nothing left to learn, it is time to be beamed up. Just my personal philosophy. So enjoy the pursuit of knowledge. You never know where it will lead us.